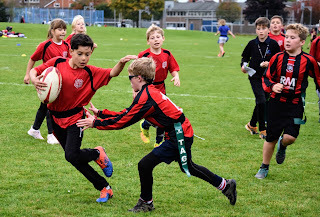 On Monday 9th October Wantage took 2 teams of year 5 and 6 children to the TAG Rugby competition. The teams were split into 2 leagues with Wantage B in league one and Wantage A in league two. Wantage B won all of their matches, winning against Stanford A, Ridgeway, Charlton A, Stanford C and St James. 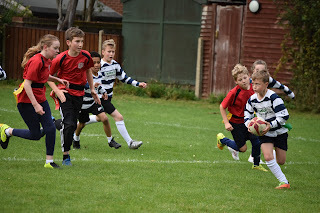 Wantage A won matches against St Nics, Stanford B, Charlton B and just losing by one try against Millbrook. Both Wantage A and Wantage B made it into the semi-final meaning they had to play each other. It was a very close match with Wantage B winning scoring the winning try in the last 30 seconds!! Wantage A played Ridgeway in the third place play off and Wantage B played for 1st and 2nd place against Millbrook. 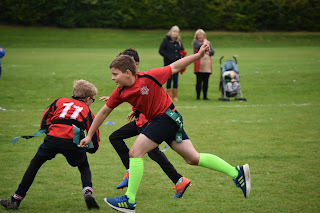 With great battles by both teams Wantage B finished in 2nd place and Wantage A in 4th place. Well done to our teams, Wantage A: James, Oliver, Kyran, Alex, Harry, Daisy, Lacey, Libby and Poppy. Wantage B: Tom, Ethan, Henry, Henry, Bertie, Katie, Jessica, Mia and Ava.